(1) Anne runs a business called PropertySystem, which manufacturers and maintains a private currency that can be traded for goods and services. The currency exists in users’ private accounts and Anne’s company provides security services for users. If someone tries to hack into the accounts she prevents them from doing so. The company also punishes users who violate the rules of PropertySystem. So if someone steals or tries to steal the currency from users, that person may have some of their currency taken away or they may even be held in one of PropertySystem’s jails. These services are financed through a yearly service fee. (2) Anne thinks that it would be morally better if she gave money to poor people. She changes the user agreement for her currency holders to increase her maintenance fee and she gives some of the money to poor people. Or, Anne decides to just print more money and mail it to people so that she doesn’t have to raise fees, even though this could decrease the value of the holdings of her richest clients. (3) Anne decides that she doesn’t like PropertySystem competing with other providers so she compels everyone in a certain territory to use PropertySystem’s currency and protection services and to pay service fees, which she now calls taxes. …[T[here are moral reasons in favor of Anne’s policy changes from (1) to (2). She changed the property conventions in ways that did not violate anyone’s pre-political ownership rights while still benefiting the badly off. If Anne implemented policy (2) after she started forcing everyone to join her company (3) it would still be morally better than policy (1) despite the fact that (3) is unjust.This is the reason I favor a basic income. Such a policy balances the reasonable complaints that people may have about the effects of a property system that they never consented to join. Though redistribution cannot justify forcing everyone to join a property system, it can at least compensate people who are very badly off partly because they were forced to join that property system. Some people will do very well under a property system that nevertheless violates their rights. But it is not a further rights violation if a property system doesn’t benefit the rich as much as it possibly could. Flanigan’s logical confusion is astounding. To begin with, if (3) is “unjust,” implementing (2) as a subset of (3) almost certainly expands the scope of injustice. Flanigan assumes, without justification, that those who are “very badly off” in are so “partly because they were forced to join the property system.” What’s much more likely is that those who are “very badly off” would be very badly off inside or outside the property system because they lack the mental or physical wherewithal to better themselves. By the same token, most of those who are very well off under the property system — including most members of that despised straw-man class, “crony capitalists” — probably would be very well off outside the property system because they possess the wherewithal to better themselves. The current “system” — the U.S. under the Constitution that was ratified by some of the people in 1788 — began with the imposition of a more intrusive central government on all of the people living within the geographical area defined as the United States. The constituent jurisdictions — the States and their political subdivisions — were governed to greater and lesser degrees of intrusiveness. But, slaves and indentured servants excpted, Americans were free to move to jurisdictions that they found more congenial. The westward expansion of the United States under minimalist territorial governments made “exit” an especially attractive and viable option from the late 1700s to the early 1900s. With the end of slavery (but not of government-imposed racial discrimination), negative liberty reached an apogee (for whites, at least) during the late 1800s. The Progressives of the late 1800s and early 1900s — a vocal and eventually powerful minority — then began to use the central government to impose their paternalistic designs on the populace as a whole. There have since been some pauses in the accretion of power by the central government, and a few reversals in selected areas (e.g., limited “deregulation” of some industries). But the centralization of power has grown steadily since the Progressive Era, and the exit option has became almost a nullity. Plugging that bit of potted history into Flanigan’s taxonomy, I would say that with the adoption of the Constitution Americans were thrust wholesale into stage (3). Because of the opening of the frontier, however, Americans (or a goodly fraction of them) had a shot at something less onerous for a while (call it 3-minus). But with the ascendancy of D.C. over the hinterlands we’ve all been in stage (3) for several decades. And income redistribution — whether it’s called welfare, Social Security, or UBI — is (a) nothing new and (b) nothing more than one among many features of stage (3). Nor is that the end of the story. It’s impossible to sort the winners and losers under the “system” that’s been in place since 1788 — or 1781 if you prefer to begin with the Articles of Confederation, or 1607 if you prefer to begin with the first permanent English settlement in the Americas. It would require an intricate analysis of the economic and social effects of all the laws and regulations of the the United States — or the Colonies — and their subdivisions. And it would require the allocation of those effects to every person now living. But that wouldn’t be enough, would it? Total fairness would require an accounting of the conditions in the various lands from which persons came to the United States, or which were absorbed into the United States. How far back should the analysis go? Perhaps not as far back as the origin of life 3.5 billion to 4.5 billion years ago, but certainly as far back as the advent of homo sapiens about 200,000 years ago. After all, where human beings are concerned there’s no such thing as a pre-political state of nature. Politics is what human beings “do” to get along with each other and to dominate each other, whether the polity in question numbers two or two billion persons. Any less-detailed accounting, such as the one suggested by Flanigan, is meant to discriminate in favor of those persons (or classes of persons) favored by bleeding hearts, at the expense of those not favored. Why so? Because bleeding hearts (i.e., “liberals”) jump to conclusions about who’s “deserving” and who’s not. Further, they jump to conclusions about groups, not about individual persons, as if every member of an arbitrarily defined group had emerged from the same background, in every particular. Slave owners jumped to the same conclusions about African Negroes. The all-powerful state — the state that can tax X and give the money to Y — is the moral equivalent of a slave-owner. Taxation is a form of slavery. Yes, says Thomas Piketty…. 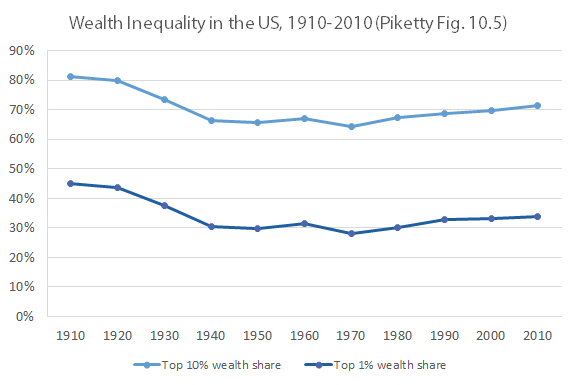 Inherited wealth has always been with us, of course, but Mr. Piketty believes that its importance is increasing. He sees a future that combines slow economic growth with high returns to capital. He reasons that if capital owners save much of their income, their wealth will accumulate and be passed on to their heirs. He concludes that individuals’ living standards will be determined less by their skill and effort and more by bequests they receive. To be sure, one can poke holes in Mr. Piketty’s story. Since the book came out, numerous economists have been doing exactly that in book reviews, blog posts and academic analyses. Moreover, given economists’ abysmal track record in forecasting, especially over long time horizons, any such prognostication should be taken with a shaker or two of salt. The Piketty scenario is best viewed not as a solid prediction but as a provocative speculation. Unlike Mankiw, I would have stopped at “so what?” The incessant attacks on income inequality and inherited wealth arise not only from faulty economic reasoning, as Mankiw points out, but also from envy and resentment. Envy and resentment are found among non-achievers, of course, but they are rampant in the ranks of the affluent. There we find pseudo-academic poseurs like Paul Krugman and Robert Reich, leftist pundits, well-heeled politicos, and cossetted bureaucrats who feast on the spoils of the welfare state. These hypocrites can’t attack “the rich” with a straight face, so they attack “the very rich,” a class that they define (conveniently) to exclude themselves. For many more readings, see the links at the bottom of “Mass (Economic) Hysteria: Income Inequality and Related Themes.” See also my many posts tagged “income inequality,” and follow the links therein. Tables 3 and 6 are especially interesting for what they reveal about changes in real income between 1992 and 2012 for cohorts at various levels of educational attainment. For example, the real earnings of men with a 9th grade education who were 18-24 years old in 1992 had risen by 94 percent 20 years later, when they were in the 35-44 age bracket. Among the male cohorts under the age of 65 in 2012, only one (of 24) experienced a decline in real earnings. Male cohorts in the 35-54 age range show impressive rises in real income between 1992 and 2012. Among women, no cohort below age 65 experienced a drop in real income between 1992 and 2012; and most experienced a healthy increase. Tables 3 and 6 indicate that persons high levels of educational attainment have done better than persons at the low end of the educational ladder. That’s simply a fact of economic life, not the result of a conspiracy. It reflects the ever-increasing demand for highly technical goods and services — from nanosurgery to Google glass. In 2012, there were 1.7 million, 8.3 million, and 17.1 million persons in the top 1-, 5-, and 10-percent income brackets. Such large numbers are hardly the stuff of conspiracies. The two curves have almost the same Gini coefficient: 0.239 for 1992, 0.242 for 2012. That is to say, the distribution of average incomes (taking men and women together) wasn’t any less equal in 2012 than it was in 1992. The details for 2012 are in the next table. (Professional degrees include MD, JD, DDS, DVM, and similarly occupation-specific advanced degrees; doctorates include PhD and EdD.) The mean is $46,615; the median, $42,250. And don’t forget, these numbers include part-timers as well as full-timers; college students as well as high-school dropouts; and a large contingent of under-educated (and probably not very bright) oldsters. These numbers don’t include the many sources of income and income-in-kind represented in the “social safety net”: unemployment compensation, disability benefits, survivors’ benefits, food stamps, Social Security, Medicare, Medicaid, and on and on. Note to Obama and friends: Go peddle your phony stories about income inequality where they’ll be appreciated — Tsarist Russia, for example.